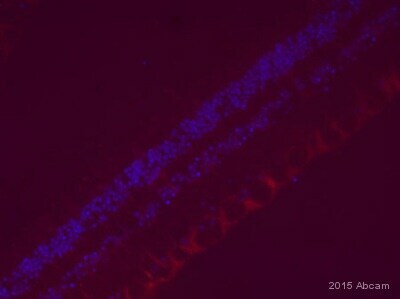 Mouse monoclonal IL-6 antibody. Validated in WB, IHC, Neut, ICC/IF, sELISA and tested in Rat, Human. Cited in 58 publication(s). Independently reviewed in 8 review(s). Lyophilised:Reconstitute with 500µl of sterile water. Please note that if you receive this product in liquid form it has already been reconstituted as described and no further reconstitution is necessary. Our Abpromise guarantee covers the use of ab9324 in the following tested applications. Neutralising Use at an assay dependent concentration. To yield one-half maximal inhibition [ND50] of the biological activity of hIL-6 (0.5 ng/ml), a concentration of 19.0-23.0 ug/ml of this antibody is required. Sandwich ELISA Use at an assay dependent concentration. In a sandwich ELISA (assuming 100µl/well), a concentration of 4.0-8.0 µg/ml of this antibody will detect at least 500 pg/ml of recombinant human IL-6 when used with Rabbit polyclonal to IL6 (Biotin) (ab84251) as the detection antibody at a concentration of approximately 0.5-1.0 µg/ml. WB Use a concentration of 0.2 - 0.4 µg/ml. Used in conjunction with compatible secondary reagents, the detection limit for recombinant human IL-6 is 0.5-1.0 ng/lane, under reducing or non-reducing conditions. This antibody was raised against an immunogen that is predicted to recognize the glycosylated form of IL6 as well as the IL6delta4 splice variant. The predicted molecular weights are 25 kDa and 17 kDa respectively. The band observed at 50 kDa may represent multimers of IL6 as reported in the literature. IHC image of IL6 staining in human spleen formalin fixed paraffin embedded tissue section*, performed on a Leica Bond™ system using the standard protocol F. The section was pre-treated using heat mediated antigen retrieval with sodium citrate buffer (pH6, epitope retrieval solution 1) for 20 mins. The section was then incubated with ab9324, 1in250 dilution, for 15 mins at room temperature and detected using an HRP conjugated compact polymer system. DAB was used as the chromogen. The section was then counterstained with haematoxylin and mounted with DPX. Immunohistochemistry (Frozen sections) - Anti-IL-6 antibody (ab9324)Image is courtesy of an AbReview submitted by Dr Ruma Raha-Chowdhury. Immunohistochemical analysis of PFA-fixed frozen murine neural tissue sections, labelling IL6 with ab9324 at a dilution of 1/1000 incubated for 24 hours at 4°C in 0.1M PBST with 10% donkey serum. Permeabilization was with 0.1M PBS and 3% Triton X. Blocking was with 10% serum incubated for 1 hour at 24°C. 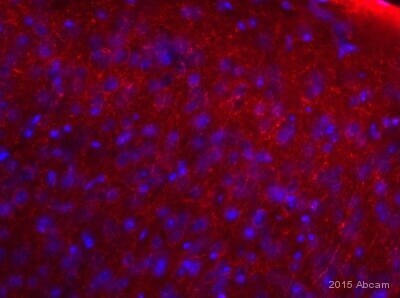 Secondary was a mouse monoclonal Alexa Fluor® 568 conjugate at 1/1000. ab9324 staining IL6 in human cervical squamous cell carcinoma tissue section by Immunohistochemistry (Formalin/PFA fixed paraffin-embedded sections). Tissue underwent heat mediated antigen retrieval in sodium citrate buffer (pH 6.0). The primary antibody was used at 0.125 ug/ml and incubated with sample at 4°C overnight. 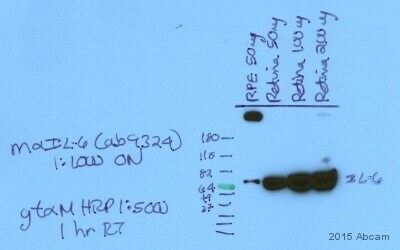 A HRP-labeled polymer detection system was used with a DAB chromogen. ICC/IF image of IL6 staining (ab9324) in rat primary microglial cell culture. The sections were incubated in 10% serum to block non-specific protein-protein interactions and in 0.3% triton X in 0.1% PBS for 1h to permeabilise the cells. The sections were then incubated with ab9324 (1:1000) overnight at +4°C, followed by Alexa 568 conjugated secondary antibody. Red staining of the cytosol was observed. Publishing research using ab9324? Please let us know so that we can cite the reference in this datasheet. All of these antibodies recognise cytokines which are present in inflammed tissue therefore any inflammed tissue would be a good positive control. Alternatively, spleen tissues seem to be a very good positive control for these cytokines and are used on several of our other datasheets. I would suggest using ab4372 if you are working on human samples, ab4613 if you are working on mouse samples or ab4624 if you are working on rat samples. Thanks for your response, and yes we would be interested in participating in the Abreview for the IL8 antibody ab34100, also will be ordering and testing both ab9324 and ab6672. Please response with any discount codes that would be helpful. These codes will each give you 1 free primary antibody before the expiration date. To redeem this offer, please submit an Abreview for each antibody and include this code in the “Additional Comments” section so we know the Abreview is for this promotion. Please remember that submission of the Abreview is sufficient for the discount code to become active. For more information on how to submit an Abreview, please visit the site: www.abcam.com/Abreviews. Eachcode will be active once the Abreview has been submitted and can be redeemed in one of the following ways: 1) Call to place your order and mention the code to our customer service department; 2) Include the code in your fax order; 3) Place your order on the web and enter the promotional code. Which IL6 antibody might cross-react with rabbit samples? Would be interested in testing ab34100 in IHC-P. Thank you very much for your call today and for your interest in our IL6 and IL8 antibodies. I've looked over the rest of our IL6 antibodies, and we unfortunately don't have any that Istrongly expect to cross-react with rabbit samples. The mouse monoclonal ab9324 could cross-react, as it does react with rat samples which are also dissimilar to the immunogen human sequence. 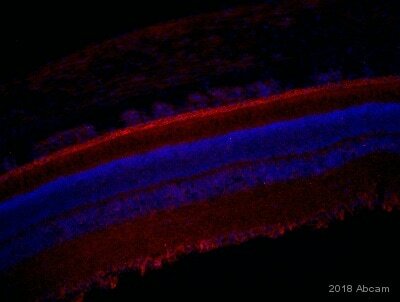 We also have a rabbit polyclonal antibody, ab6672, which was raised against the full-length human protein and may have a higher chance of cross-reaction since it is polyclonal. However if you willbe staining tissue with expected endogenous IgG molecules (i.e. spleen or tonsil) thentherecan behigh backgroundfrom reaction between the tissue and the anti-rabbit secondary antibody. I'm not sure which IL6 antibodywill be the better option for you to try, but if you would like to try either of these, we do have a testing discount program (see details below for ab34100) that you may be interested in. 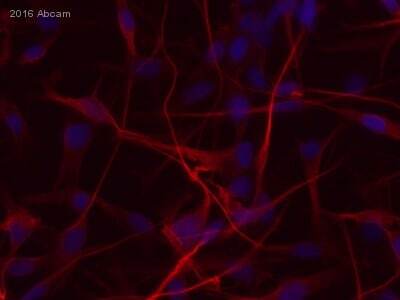 Since the IL8 antibody ab34100 has not been tested in IHC-P,I can offer a discount off a future purchase if you buy ab34100 now, test it in IHC-P,and submit feedback to us in the form of an Abreview. It doesn’t matter whether the Abreview is positive or negative, we would just really like to receive your feedback. The discount would beworth 1 free primary antibody. 1. Reply to this e-mail to let me know that you would like to proceed and test ab34100 in IHC-P. I will then send a discount code. This code must be issued before purchasing ab34100 so please wait for my reply before ordering. 2. Purchase ab34100 either by phone, fax, or online (www.abcam.com). We are always pleased to obtain feedback about our products and any information is greatly appreciated! Even if ab34100 turns out to be unsuitable for IHC-P, you will still receive the discount on your next purchase after your Abreview has been submitted. What are differences between these two products that may affect a selection of an antibody control for ab 9324 for application in cultured human hepatocytes? The anti-IL6 antibody ab9324 is a mouse monoclonal IgG2a. Therefore, you will need to use a mouse monoclonal IgG2a isotype control. Therefore, you should use the mouse control IgG2a ab18413 and NOT the rabbit IgG ab37415.